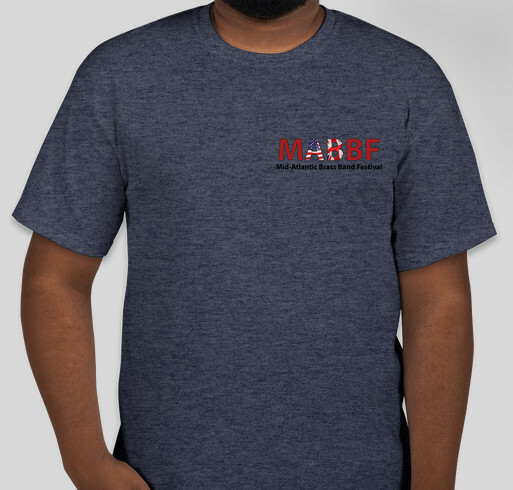 Buy a MABBF 2018 shirt to help support this year's event as well as future year's events. All funds raised will go directly to ATLANTIC BRASS BAND INC . Combining brass education, performance, & community, the Mid-Atlantic Brass Band Festival offers clinics with world renowned clinicians & performances by the region's top brass bands. The value of the Festival is two-fold- for brass musicians of all ages there are performance and educational opportunities, for the community, there is the chance to hear some of the East Coast's top brass bands and learn more about a genre of music that has it's origins in the coal mines of the U.K. The MABBF is put on annually through the all-volunteer efforts of the Atlantic Brass Band with financial support of generous sponsors/vendors/advertisers and supplemented with the sales of Festival items such as these t-shirts. Share Why You Support "Mid-Atlantic Brass Band Festival 2018 T-Shirt"